Sorry I haven't blogged for a while-- many things keeping me from blogging. 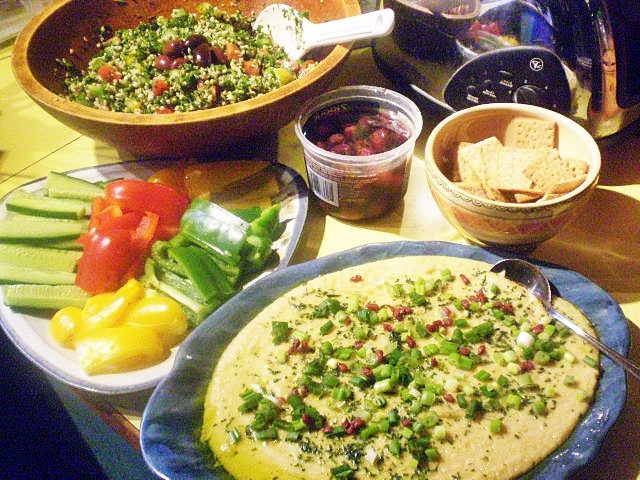 The delicious dip (or spread) in the photos and the recipe below is my take on a Syrian dish called Fooliya (pronounced Foo-lee-ya), which is made with dried fava (or broad) beans. I have a hard time finding dried fava beans in my area. 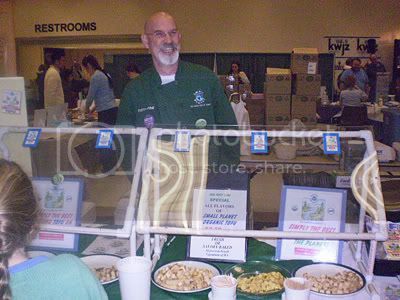 However, I have noticed that cooked, pureed dried favas are similar in taste to cooked, pureed dried yellow split peas, so I use the split peas as a substitute, with good results. (They are much cheaper and more available in many areas, too.) 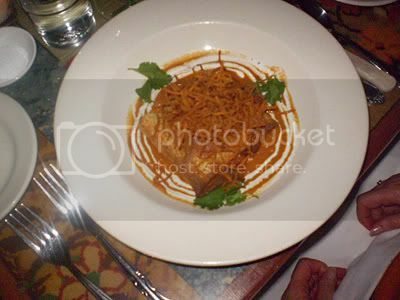 The onions cooked with the peas lend a lovely sweetness to the puree. This dip makes a nice change from the equally delicious, but ubiquitous, hummus, and is just as nutritious. Leftovers could be mixed with some broth and/or water to make a light soup, as well. Serve at room temperature with crackers, flatbread, or raw veggies. Place the split peas, water and onion wedges in a medium pot and bring to a boil. Turn down to medium-low, cover and cook for 30-60 minutes, or until the peas are softened and the water is almost absorbed. Pour the mixture into a food processor and process until smooth (Take the pusher out of the funnel and cover the hole loosely with a folded clean tea towel, so that steam does not build up inside the processor.) Add 2 tablespoons of the olive oil, and the lemon juice, salt and pepper. Process briefly again. 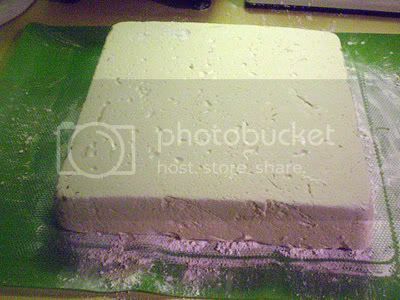 Scoop the mixture onto a large , flat bowl, or plate with a bit of a depression in it (see picture). 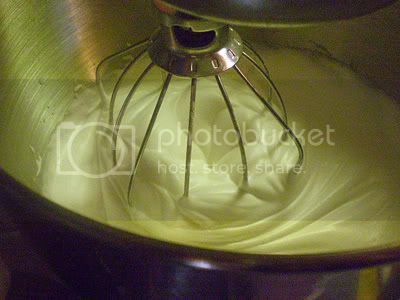 Smooth the mixture out. Drizzle with the remaining olive oil and use the back of a clean spoon to spread the olive oil around evenly. Allow to cool to room temperature, then sprinkle with the garnishes. 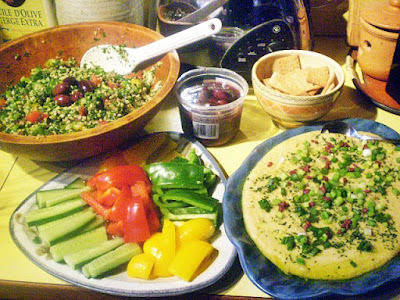 Serve with raw vegetable dippers, crackers or flatbread. Leftovers should be refrigerated in a covered container, but bring to room temperature before serving. Nutrition (per serving): 165.5 calories; 37% calories from fat; 7.1g total fat; 0.0mg cholesterol; 478.6mg sodium; 331.4mg potassium; 20.2g carbohydrates; 7.1g fiber; 4.1g sugar; 13.1g net carbs; 6.6g protein; 3.1 points. 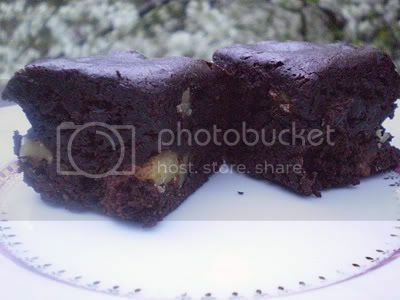 Have you heard about Black Bean Brownies? I just heard about them last week. There's a recipe (which just happens to be vegan) making the rounds of the Internet, and I heard good things about it. It sounded intriguing, even though it used packaged products. Here is that recipe (there are other versions online, but most contain eggs, and the only vegan one I found looked too gooey for my taste). The recipe is just a can of black beans, pureed, mixed with a box of brownie mix. So, I bought my first box of (organic) brownie mix, and a can of black beans. You puree them with the liquid in the can. I was a bit leery about this, as I usually don't like the taste of canned bean liquid and, if I use canned beans, I rinse it off. I should have listened to my instincts! ...that is, before I dumped them! 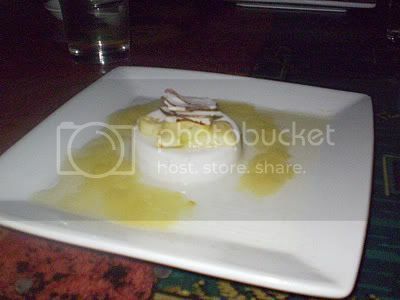 Yes, as you can see, we only tried a little bit of them, but DH and I agreed that they were awful! The texture wasn't bad, but it tasted so beany. But not "nice beany"-- it was "nasty beany"! I was right about the liquid. Yuck! I honestly don't know why they are so popular. Not to be deterred, I devised my own from-scratch vegan version (using home-cooked beans, BTW), very chocolatey, and we loved them, omni friends loved them, and no one could tell there were beans in them! 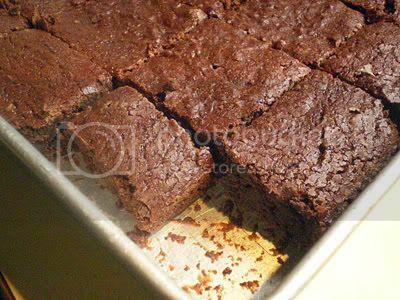 The recipe is the same as my Okara Brownies, except that you omit the okara and instead use 1 cup UNSEASONED home-cooked black beans (or very well-rinsed canned black beans), with a little water (it should all fit in a 1 cup measure). DO NOT use the canned bean liquid, please! 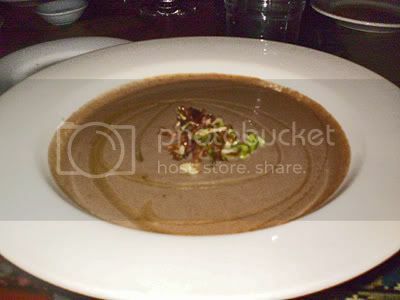 Follow the recipe here, substituting beans for okara as instructed in the preceding sentence. 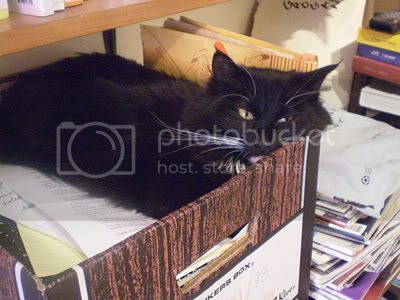 UPDATE Dec. 2011: NEW, STREAMLINED, ALMOST-FAT-FREE VERSION HERE! Alice sells vegan marshmallows, which has taken no small amount of devising since we found out that Emes Kosher Jel was not really vegan, and other kosher jels wouldn't work. Clever lady that she is, she devised a kit that could be easily mailed out internationally to give those of us who don't live in beautiful New Zealand a chance to try her marshmallows, AND have the satisfaction of making them ourselves. 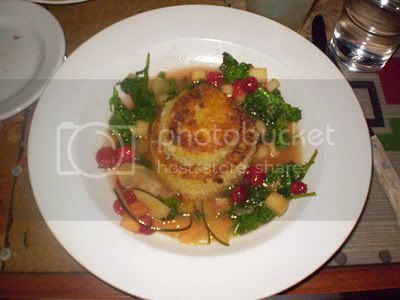 Just replace the gelatine (blerrgh!) with agar? Not so simple! 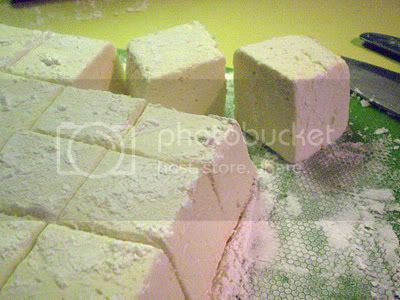 Now, Angel Food takes the angst out of the situation with our new make-your-own-vegan-marshmallows kit. It contains all the specialist ingredients for making about 50 good-sized drool-worthy marshies (plus the recipe, of course). You just need to add sugar, water, syrup, vanilla essence and starch or coconut, and you're away! The kits are only available by mail order and online purchase, and yes, we ship world-wide!" If you dry the marshmallows in the open air, not touching, for 24 hours, you can then store them in an airtight container for 2 weeks! 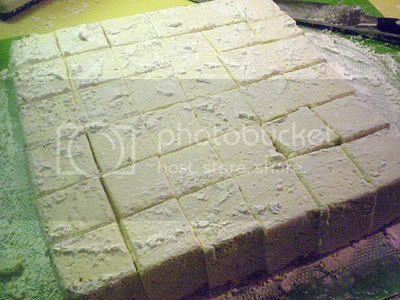 Now, I'm not a marshmallow fanatic-- I can live without them, and have done for some years! 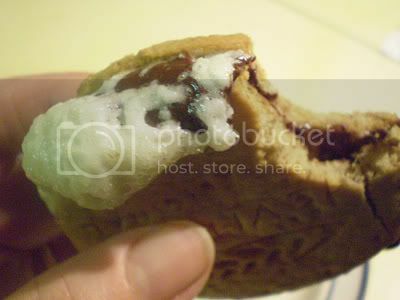 But, many, many of my readers love them, and I used to love S'Mores as a kid. I thought I would make a vegan version of S'Mores with my homemade "marshies", as Alice calls them, and organic chocolate, etc.. I figured that my grandchildren would enjoy them, too! Now, I am not a candymaker-- I love experimenting in the kitchen, of course, but not usually with candy thermometers and lots of sugar! However, I assembled everything on my counter and followed Alice's instructions. It takes a little time, but it's easy and the results are fantastic! This is the contents of the first packet beaten for about 5 minutes with water to a stiff "fluff". 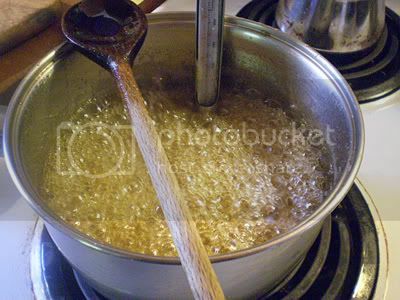 This is the sugar, water and syrup (I used agave nectar) mixture boiling to hard ball stage. 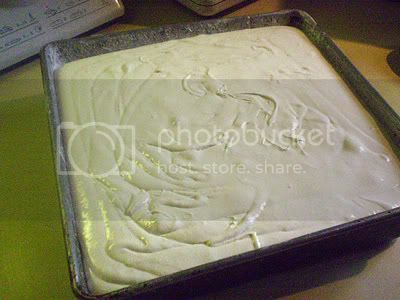 There is another mixture consisting of the contents of the second packet and some water, that you eventually mix with the syrup, and then beat into the white "fluff" with some vanilla. A couple of hours later-- real marshmallows! NOTE: I used a 9" square pan because I didn't have the 10" square pan Alice called for, so mine are quite think. 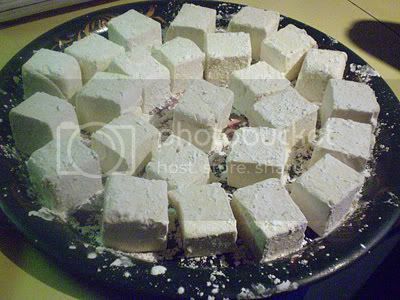 I cut 36 large marshmallows, but 50 smaller ones, as Alice recommends, would probably be better. You can roll them in coconut or starch. Instead of graham crackers and Hershey bars, I used PC Organics Chocolate Digestive Biscuits (vegan, organic digestive biscuits, which are similar to Graham crackers, but round, with organic dark chocolate on one side). You heat the marshmallow (more about that below) and then sandwich it between two of the biscuits, with the chocolate sides in. The hot marshmallow melts the chocolate, and-- sweet, gooey bliss! Instead of the above, you can use your favorite vegan, organic chocolate and vegan graham crackers, or vegan digestive biscuits (you might have to make them yourself-- here's a recipe, but you'll have to sub for the milk and butter). "My son Mack and I have actually toasted the marshies, on a beach over a tiny little fire tucked into a rock shelf. They were more delicate than I remember standard marshies being when toasted, but they did crust on the outside and melt in the middle." The wood fire in our heater had gone out, so I couldn't try toasting them on a skewer. One recipe I saw on the internet said you could microwave them, but DON'T! These ones melted in seconds! 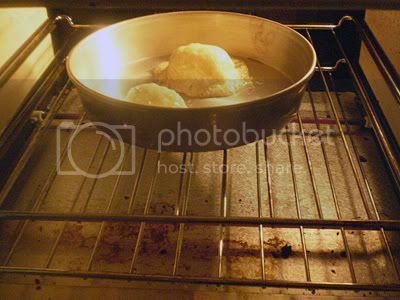 I ended up placing them on a cake tin and putting them under the broiler for a short time (watch carefully!). They didn't brown, but got soft and hot. Do give these a try! Enjoy! HOME FROM SEATTLE VEGFEST 2008! 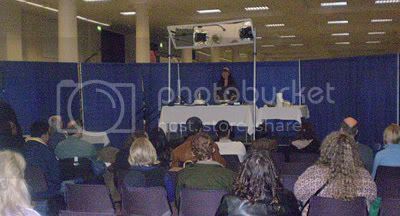 Starting one of my workshops at Seattle Vegfest last weekend. 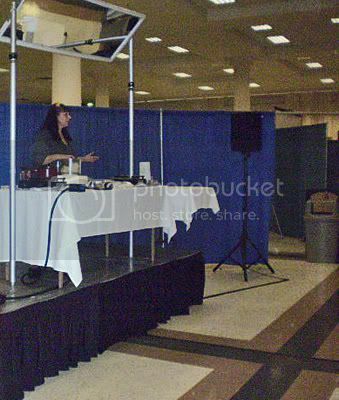 I was honored to be invited to present two workshops last weekend at Seattle Vegfest. What a wonderful event! 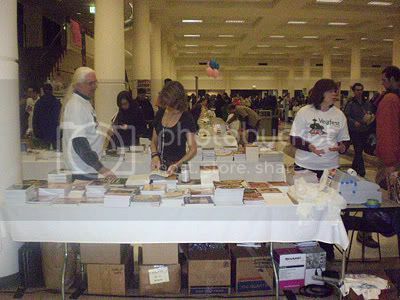 It's so nice to be with so many vegans and vegetarians, to see so many interested people, and to be able to taste so many new foods! The intrepid and incredibly hardworking organizers and volunteers worked so hard to pull off this great 2-day vegetarian event. 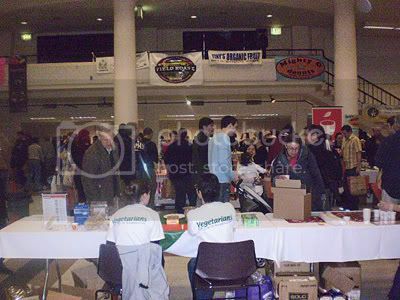 Vegetarians of Washington signed up over 600 new members on Saturday alone! What a coup! VegofWa's intrepid leaders, Stewart and Amanda! I demonstrated two easy Italian dishes on Saturday morning-- Pasta alla Puttanesca, and Easy Tuscan Beans with Spicy Vegetarian Sausage (see the recipes at the end of the post). 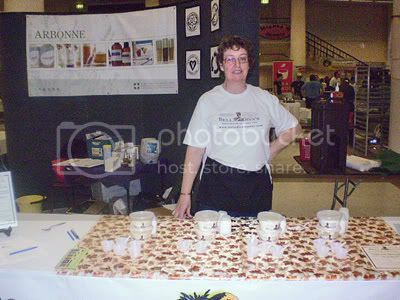 On Sunday I demonstrated two easy pie recipes-- French Strawberry Pie and Chocolate Banana Creme Pie. Both demos were well received. 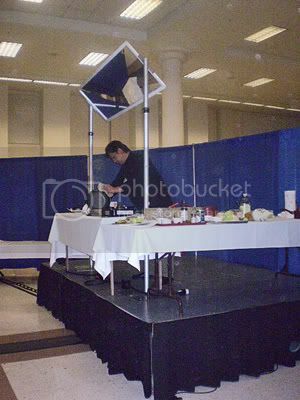 There were cooking demos and lectures going all day, both days, all free with the $5 entrance fee-- quite a bargain when you consider all of the food samples you could scarf down throughout the day! 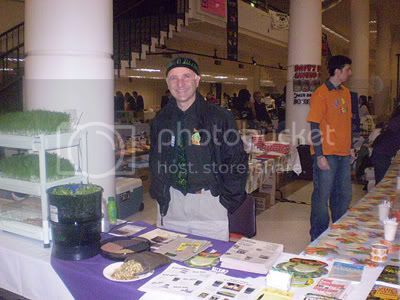 Vegfest was so busy that, at times, one could hardly walk down the aisles! 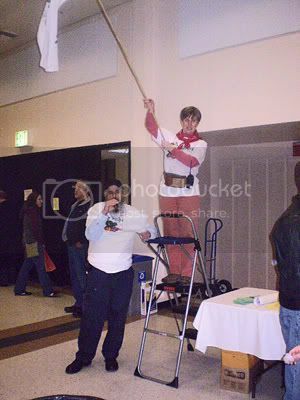 But everyone was polite and helpful, and the mood was generally upbeat and exciting! 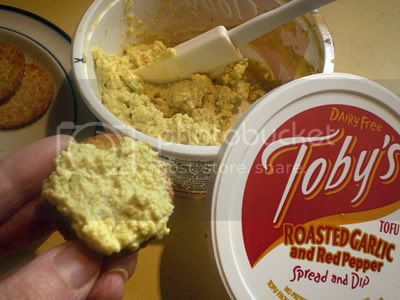 Toby's Tofu Paté, which is like a delicious deviled egg mixture, but vegan! There are 5 different varieties. Unfortunately, they are not sold in Canada. 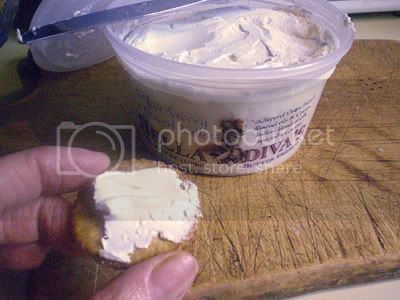 Bella Diva's Vegan Savory and Sweet Butters are whipped almond oil and cocoa butter blended with specialty flavors. It doesn't really taste like butter, but it's very tasty and rich. For vegans who want a raw spread, or who prefer not to use margarine, even a good one like Earth Balance, or who just want something different, this is a delicious new product. It is certainly better for you than coconut oil! There is a plain version, and also Praline, Orange Almond, and Blackberry, sweetened with agave nectar. 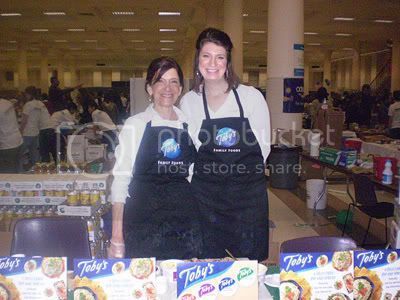 Check out their page for the ingredients, etc.. 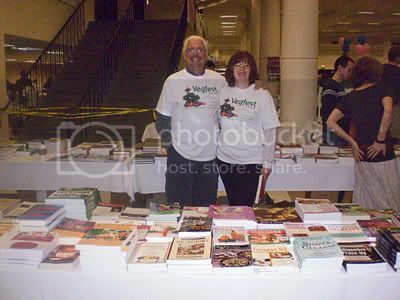 Here are some more pictures from Vegfest (and see more here, on Stuti's blog). I'll be blogging a little more about products, etc., in the near future. 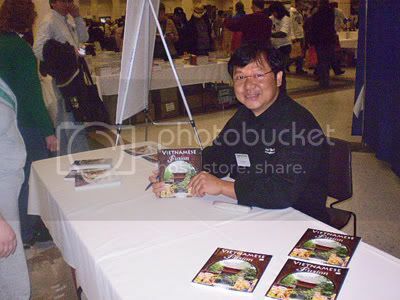 Chat Mingkwan, author of Buddha's Table: Thai Feasting Vegetarian Style, and Vietnamese Fusion, two great cookbooks. He's a teacher and cooking tour guide as well! 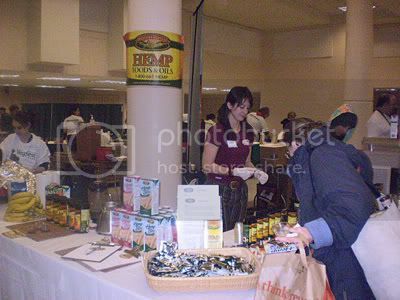 Manitoba Harvest Hemp products booth (the Hemp Bliss! people!) 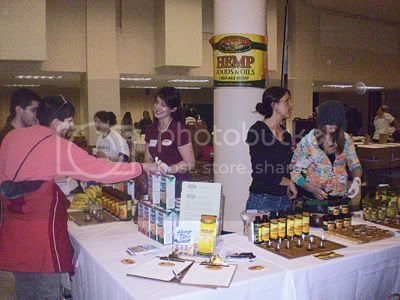 -- their organic hemp milk is creamy and delicious! 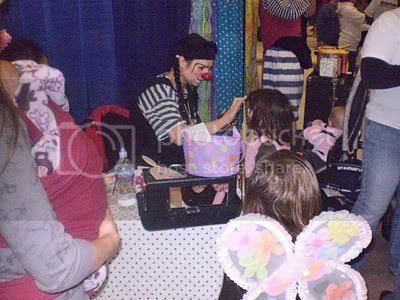 A Vegfest clown for the kids! 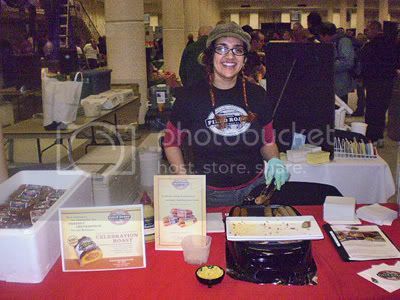 Small Planet Organic Tofu-- delicious marinated tofu! 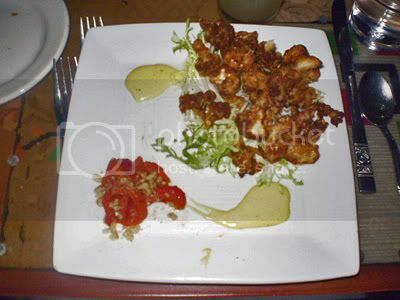 Roasted Cauliflower appetizer-- very crispy! This can be made with leftover homemade spaghetti sauce, or a good jarred sauce, canned or frozen cooked white beans, and commercial spicy vegetarian sausage. Nothing could be easier, but it’s a very delicious and satisfying meal. Serve with, or on, crusty bread. 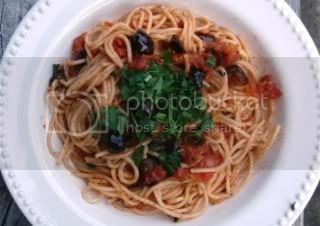 This is an easy adaptation of a recipe in Nonna's Italian Kitchen. In a medium pot or deep skillet, heat the olive oil. Saute the garlic briefly, then add the “sausage"slices and brown briefly. Add the remaining ingredients and simmer for about 10 minutes, or until the flavors are mixed. 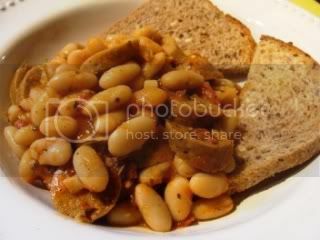 Serve with crusty bread, or, for a new twist on the “beans on toast” theme, serve it on the toast. Nutrition (per serving): 325.1 calories; 29% calories from fat; 9.9g total fat; 0.0mg cholesterol; 163.3mg sodium; 529.9mg potassium; 33.3g carbohydrates; 9.5g fiber; 0.0g sugar; 23.8g net carbs; 20.7g protein; 6.5 points. Nutrition (per serving): 265.4 calories; 11% calories from fat; 3.2g total fat; 0.0mg cholesterol; 163.1mg sodium; 529.8mg potassium; 33.3g carbohydrates; 9.5g fiber; 0.0g sugar; 23.8g net carbs; 20.7g protein; 4.8 points.